You may have noticed that we’ve not sent out any Mesa News emails for a while and that our Fall 2012 schedule of classes and events hasn’t yet been posted on the website. This is not an oversight. Some close to us have empathetically or psychically picked up that something disturbing was happening and sought us out. Others have heard through the grapevine about our story or figured we were just busy. At the other end of the spectrum are those of you who are brand new to our email list and are receiving this as your introduction to our newsletter. In any case, please bear with me. I’d rather tell more than less of our story to spare us from repeating it. In the middle of July, after a couple of months of vague physical symptoms of fullness, weight loss, fatigue, and irregularity that many good psychics, medical intuitives, and holistic healers of all stripes perceived as bowel issues, my dear wife and Mesa Co-director, Kate Silberberg, asked me to take her to the emergency room. Her belly had begun to swell dramatically and she was experiencing pain in her right side. The appearance of this intense level of “dis-ease” also reflected what had been building for Kate on the emotional, mental, and spiritual levels for a much longer time. She had been searching to find her own relaxed, empowered, and effective way of being in our world and the universe within herself, but often felt restricted by things we had yet to put a finger on. A CT scan revealed masses in Kate’s pelvis in the area of her ovaries, a discovery we were told was consistent with ovarian cancer. The ER doctor was in a high state of alarm and urgency. Imagine our shock at this pronouncement. How could this happen? Weren’t we consuming good healthy food and water, consistently using holistic healing modalities, and walking a spiritual path? We had sacrificed much to work as healing helpers and teachers. Was this how we were to be repaid by the Universe for giving so much to others? Why Kate, one of the kindest, most loving of souls? What did it all mean? What were we to do? From the ER we made a call to Kate’s primary physician to come in for advice and referral. Ten minutes later, we got a call back with a time to see him first thing the next morning, the result of a cancelled appointment. We were both scared and confused. We needed to know what we were facing and how to proceed. We needed a plan. We took a step back and decided to consulted with a dear friend and mentor to set a course of action, ponder the spiritual implications, and cry a few tears. We drove straight to her house from the ER and appeared on her doorstep. She took us in, hugged us, gave sage advice, and fed us dinner. This helped greatly to ground us. Kate’s physician agreed with the ER doctor that Magee Hospital’s gynecological oncology department was the place to go, but had no recommendation on who to see. We looked at the doctors’ photos online, like choosing from some high tech phone book. The next day we took Kate to be examined, opting for the first available appointment. The doctor, though a well rated surgeon with an impressive résumé, gave us almost no information and little confidence in his approach, to wit: “You have ovarian cancer. I’ll cut you open, take everything out, and give you chemo… period! But don’t worry… if I have to take some of your bowel out I’ll put it back together and you won’t have to wear a bag for the rest of your life…” We had no idea what was going on and Kate was becoming more frightened than she already was. I was trying not to go insane. The experience and its energy wasn’t feeling at all good to us. When I broke the ice about our working with “complementary healing” (I thought that less challenging than the term “holistic”.) he responded that he was OK with Kate making some “lifestyle changes” and reassured us that he was not only a scientist, but a Christian. (“Lifestyle changes?! !”) Total elapsed time for exam and discussion: about 20 minutes. We were living our worst nightmare. We were sent to another room to schedule Kate for surgery and were appalled to receive an appointment over a month away—the doctor’s first opening. We were so shocked we asked the secretary to check with the doctor to see if Kate really had that much time to wait. She came back and assured us she did. We accepted the date, but told the secretary (much to her blatant chagrin) that we would not likely keep it. Over the weekend, we stewed over what to do. The next business day I made some phone calls and in a few hours we had another appointment with a different surgeon suggested as a “better fit” for later in the week. We could have done what many do and stuck with the “horse we came in on”, but chose instead to trust our guts and interview another doctor who better matched our needs and our approach to healing. When I looked at his photo online, I was overcome with emotion. He would be the one to help us. A few days later we met with the second physician who not only walked us through the CT scan images, but even pulled out the plastic model woman to show us what was what. He referred to us endearingly as “you guys” and we greatly connected with him on the spot. We knew he cared and would put Kate’s welfare first. He recommended doing an exploratory surgery right away with an eye on giving Kate chemo first, and removal surgery (unfortunately referred to as “debulking”) later, and only if necessary. When the time came, if he saw he could do a clean job, or felt that removal was imperative, he would make the decision when he was looking inside her belly. We left the doctor’s office and took up a friend on an offer to give Kate an acupuncture treatment, to at least help her relax and calm down. He pressed little seeds into each of our ears and put tape over them, telling us they would help our “spirit relax”. Kate dozed on the table and I conked out in my chair for almost half and hour. By the time we got back home from Shadyside, there was a message to bring Kate in the beginning of the next week for a CT guided biopsy and to have fluid drained from her swollen abdomen. Things were quickly picking up speed and we were grateful. After years of being completely out of the system of conventional (Western, or allopathic) medicine, we were suddenly launched headlong into it with Kate in and out of the hospital for the next several weeks. At the same time, we recognized that we were being Divinely guided and saw the necessity to rely on our higher intuition, rather than let fear plot our course. Kate had the exploratory surgery and the doctor came to get me only a half hour later. Despite hands-on and distant healings from many, the tumors were still there and additional disease was present on the walls of her pelvic cavity. We’d have to wait for the lab report on the tissue samples the doctor took to organize our next move. Kate would stay overnight in the hospital and go home the next day. I brought Kate home the following day, but by the middle of the night she was vomiting and scared. I called the doctor and took her back to the ER at Magee to be readmitted. Her bowels had not awakened from the anesthesia. She spent the next few days resting and getting different IV medications. Her legs began to swell with fluid. We felt stalled. Between extreme weight loss and the edema, Kate’s body had taken on a whole new shape.. She hardly recognized herself. I was told that it was the cancer, not the saline solutions that had cause the swelling. This was wholly counter-intuitive for me but I realized that we and the doctors were in that tricky place of trial and error to get Kate stabilized, diagnosed, and started on the road to healing. Initial pathology testing showed that Kate’s pelvic tumors were indeed cancerous, ovarian in nature. I was asked to make an appointment for a chemotherapy consult and she was to be released from the hospital later that day. When I came to pick her up, she was back in bed, and the doctor had left word for me to call him as soon as I arrived. He had not been satisfied (God bless him–) with the pathology report. Something hadn’t looked right to him. But if it wasn’t ovarian cancer, where was it coming from? Another specialized CT scan revealed a small tumor on Kate’s pancreas and the diagnosis changed: pancreatic cancer metastasized to the ovaries. This was astonishing news. The doctor was visibly shaken when he told us. A pattern of pancreatic cancer ran in Kate’s family, but we never imagined she would express it herself. As usually happens, (I found out later) there had been very few overt symptoms until the cancer imbalance had become advanced. The good doctor had recognized the giveaway signs I later read about for it not being ovarian tumors and trusted his intuition. He too, had been guided. We were very lucky. At that point we were passed along to a new set of doctors and nurses, a group of really caring men and women at Sewickley Medical Oncology and Hematology in Moon township PA. There, her specialist introduced himself with his first and last name, rather than “Doctor so-and-so”, and asked if he could draw close to talk with her. “You know you’re really sick, don’t you…?” he began. Gratefully, he never spoke of statistics or prognosis, only recommending that Kate start chemotherapy with the most aggressive combination currently available for pancreatic cancer as soon as possible. We mentioned our work with alternative healing and were only asked to keep him abreast of supplements, and not to use any herbs because their effect on the chemo drugs was not well understood. There were vague issues about the use of supplemental antioxidants that we still need to have resolved. Chemo. We had heard so many bad stories about chemotherapy nearly killing patients, but it seemed the best course for Kate to follow considering the advanced stage of the cancer. (“You can’t let Kate have chemo…!” some have chided us…) We saw our assignment as speeding the successful demise of the cancer while minimizing the side effects from the highly toxic cocktails. The decision was hers, with the support of many of our friends and advisors who had actually faced cancer, not just read about it. We saw the possibility: We were to learn firsthand how to merge the polarities of scientific medicine and holistic/spiritual healing to reverse cancer imbalance. We wondered if we were up to the challenge. After her first round of intravenous chemotherapy Kate did pretty well, with few bouts of diarrhea or vomiting. A few days later she was to be given a shot to stimulate her immune system to produce more white blood cells. These cells are particularly vulnerable to the chemo drugs and Kate would be open to infection if their numbers dropped. If that happened, the chemo would be halted until they rebounded. That would be a setback. The day after the shot, Kate had some kind of reaction to it. She had been OK in the morning, so I left early to go up to The Mesa to teach a Reiki II class. Unbeknownst to me, her temperature was going up and she was in more pain. It was 6pm before she called me to find out when I was coming home and I could tell something was happening. I asked her what was wrong and when she explained her situation, I asked if she had called the doctor. She hadn’t. When I asked her why she told me she didn’t know where his number was. I was stunned. She had really made no effort to look for it. She was waiting for me to intervene. In part, she was afraid of making a mistake. I had seen that reluctance to choose and act before. I got a bit angry with her on the phone, in part because she had taken neither responsibility nor action. Some of it was also with myself because I had not been there with her when trouble arose. She in turn got angry back at me, in part because I had chided her, and in part because she had let herself down. When I got home I called the doctor for her and he told us to bring her back into Sewickley Hospital where she had had more fluid drained and her IV port put in before the chemo. By late that evening she was readmitted and I went home to sleep alone. The next morning as I came to consciousness, I heard something from my Higher Self. Kate was at a crossroads. I immediately realized the implications of that statement. If Kate didn’t take responsibility for her own healing sure would surely die. I knew I couldn’t be with Kate every minute and that she had to make a change. She really didn’t like me telling her about it on the phone while she lay in the hospital and (to keep the peace) I backed off. I talked with our spiritual “big sister” about what had happened and how Kate had gotten upset with me. I then used our Soul-to-Soul Connection technique to communicate with Kate on the level of her spirit about what I had heard, because I knew that only she could really bring about her own healing. Thankfully, our friend went to see Kate in the hospital the next day and talked with her about her duty to herself to take charge of her life. Either way and to my relief, she got the message. I made sure she knew where all of the important phone numbers were and she began to make her own calls. Meanwhile, we and others had begun to pray for and about Kate, myself as her primary caregiver, our work at The Mesa, our sanity, and our finances. As is often the case these days, when we began this journey at the ER, we had no health insurance to cover procedures or prescriptions. We immediately set to activating Kate’s school teacher’s retirement (delayed in the hopes it would continue to grow.) so that she could get medical coverage with that large group, and to pay mounting bills. There we experienced a true miracle. What normally would have taken 4-6 weeks to process was done for us by compassionate strangers in one day. Only the first two weeks of our ordeal were without it. Our introduction into the world of cancer treatment become a crash-course. We had only just begun to see clients in our healing center who were dealing with it, perhaps in preparation for what we ourselves were about to face. I quickly learned how much information is out there and that much of it conflicts, both between and within the natural healing community and the scientific world. The bottom line would be to help Kate feel better in the short run and completely heal her body, mind, and spirit in the long. We would have to rely on Spirit, our higher intuition, and pay attention to avoid pitfalls and setbacks. So far, Kate has had two rounds of chemotherapy, each lasting 9hrs at the treatment center and continuing 46hrs at home with a portable pump. She has at least 4 more to go. I go in with her and do energy work and use our TC Energy Design glassware with every medication she is given to clear and reorganize them for her increased benefit. We pray over them. My observation and sensitivity to energy tells me it is working, but I am unwilling to risk not using it for the sake of a double blind test. We’ll “prove” it by her rapid recovery. I also mitigate the grueling chemo process with energy healings, spot remedies (like peppermints, Rescue Remedy, and acupressure) guided imagery, cheerleading, and snacks as we go and we are having pretty good success with managing the nausea and vomiting after treatments. We know it could be far worse from the stories we’ve heard. The nurses are very accepting of us and our approach, in part because we ask for what we need nicely, express constant gratitude, and because we have taken the trouble of learning to speak their technical language. These very caring women are also very inquisitive. Kate and I are teaching them about energy and consciousness, the same way we do our Mesa students. We just substitute the word “vibes” instead of “energy”. <grin> We understand that this is part of the “why?” to it all. We are showing mainstream health care workers new ways of understanding and treating cancer imbalance. We are studying to become cancer healers first hand, like Dr. Walter Reed giving himself malaria to test its cure in an effort to help others. First and foremost, however, this experience is Kate’s spiritual journey of transformation. On that terrible day at Ohio Valley Hospital, it seemed entirely possible that Kate’s transformation might be by quickly going back to the Spirit World (dying). While our fearful thoughts and emotions entertained that outcome, to our Higher Knowing that made no sense. Clearly it would be a waste of our Twin Flame incarnation, our life mission to help change the world for the better, and everything that has gone into preparing it. In rare moments of clarity inside myself back then, it simply didn’t feel right to me—no matter how dire the situation looked. Present also was the possibility that Kate would be slowly ground down by chronic illness and prolonged suffering only to die a handful of years down the road. One friend told us she could “survive this with reasonable quality of life”. “What does that mean?” I asked. “She won’t want to kill herself?” I bless those who endure walking this middle path as their journey. We are grateful that we have been able nearly from the start to focus on the third and highest path that simultaneously exists, that of Kate becoming completely cured and helping others with cancer imbalance. We do this with the full understanding that we don’t have to know how it will happen. We just have to focus on her complete healing where it already exists. As cruel as it may seem, we also know that Kate’s process is, in part, to heal group Karma for all of humanity. The rampant nature of cancer within our species makes it pretty plain that we are poisoning ourselves, physically, mentally, emotionally, and spiritually, and are terribly out of balance within and without. This must be healed for all of us to survive at higher vibration. Kate has commented that the oncology center waiting room “looks like a bus station” with so many people sitting around in the sea of chairs, and the continuous comings and goings. We see the ones attended by friends or loving relatives, and those who are facing illness alone. I was appalled at the sheer number of people receiving chemotherapy in just one center on one day. The energy of the treatment room feels horribly unbalanced, “gritty” and abrasive, a result of the killing power of the drugs and the fear, anger, and shame of the patients, most of whom sit alone. I send them love, too. We have become part of a community new to us, one of patients, trained medical personnel, and family caregivers that is a subculture in itself—revolving totally around severe or chronic illness as the unifying factor. While our experience with the medical world has been blessed overall, we have seen evidence of a work-hardened system. This is evidenced by boilerplate policy, jaded personnel, lack of communication, and outdated information held as truth. Every drug side effect is to be routinely mitigated with another pharmaceutical. (The nurses didn’t know about wrist pressure points for nausea, but chuckled knowingly at our mention of Kate’s use of “special brownies”.) The nurses told Kate what side effects she was going to have instead of alerting her that she might. We gently suggested there were other possibilities and are teaching them about “languaging”, like calling the drugs “pain relievers” instead of the standard “pain meds”. (I’ve often wondered what goes on at those “Pain Clinics” I see advertised…) It all needs to be done in a better way and can. This is now part of our work. From a broader standpoint, we have come to see that this experience is a transformation not only for Kate, but also for our relationship, our work at The Mesa, and for many others who will be touched by us and her story. When the 7 Tibetan monks who visited our center back in May returned to Pittsburgh at the end of June, we actually talked with those present about a change we both could feel coming for our spiritual work. Sitting around the kitchen table I told Kate that I felt that the general direction of what we were doing was to stay constant, but the way we were going to go about it was about to radically change—this just two weeks before our trip to the ER. We also recognize and celebrate the myriad small miracles that have occurred for us along the way. We have been guided to just the right doctors and the right medical treatment. Caregivers of high consciousness have been magnetized to us as well, minimizing the mistakes, poor treatment, waiting, and wheel spinning that often plague the medical process. Gratefully, we have received blessed help from our Mesa family, neighbors, and complete strangers in the form of meals, money, tips/contacts/helpful information and sympathetic ears that continues to amaze, humble, and move us to tears. Many of those we have communicated with have offered to man our gift shop, drive Kate to treatment, or take care of Sedona Arizona, our Mesa cat. (Sedona’s OK, too—just a little lonely. We took Kate to see her last week…) We need to drop all reluctance with respect to this level of receiving. One of the most precious gifts we have received to date was that of two units of human blood that were given to Kate last week. She had become anemic as a result of the cancer and from not being able to get in or keep down much food, more from the internal pressure of the cancer than the chemo itself. When I held the first pint in my hands I could feel its tremendous life force. I could also sense the donor; a man, I felt. It felt widely “smart” to me, but also somehow distressed or out of alignment. I put the bag under our large TC Energy Design plate, right under the Flower of Life symbol, asked our Healing Guides to put whatever they saw fit into it, sent in some healing energy, and sat down to wait for the process to complete. Within a minute or so, Kate and I simultaneously felt the blood relax. After all, it had been processed somehow to take out the white cells that Kate didn’t need in her over excited immune system. I narrated what I was feeling to the nurse. I told her to imagine a sheet of rubber held down by its edges. “Think of pinching it and pulling it up from the center,” I said. “That’s how it was. Now it’s relaxed back down.” Kate nodded. I then picked up the bag again and returned my attention to the energy and consciousness of the blood. Not only was the life force in it much stronger and purer, it also felt like Love and Life themselves. I also recognized its nature as a gift, certainly from the donor, but also from Creation itself. What surprised me, however, was its undeniable perfection. It is a perfect medium for life, created by a perfect intelligence. This perfection flows through each and every one of us equally and constantly. By this I was moved nearly to tears, and by watching and listening to me, so was the nurse. She asked for our card for a friend in need. Kate and I took turns dozing in the semi-darkened room as the blood slowly went in. At one point I woke up and looked over at her from the foot of the bed. Out of the corner of my eye, I saw something bright and densely white about the size of a person move parallel to the wall over to my right. I turned to see what was going on, ostensibly out in the hallway, only to find that the door was shut! What I had seen had been in the room with us. From day to day, we have bounced up and down. It’s been hard to be upbeat every second. When Kate was feeling poorly or had a new side effect from the chemo it was disheartening. (I’ve watched her lovely long hair coming out in small brown bales.) I feel many of her symptoms and emotions empathically and directly and they are hard for me to separate from my own. Many of our days have been spent having tests or treatments, or waiting for symptoms to pass. I have been Kate’s chauffer, advocate, historian, (What meds she’s taking and how much, when did she have the last whatever, etc.) waiter, entertainment, masseuse, and communications interface—asking needed questions on her behalf, making appointments, talking to doctors and well wishers on the phone when she’s been weak or tired. What may be our biggest blessing so far came just the other day when I met with a woman we recently reconnected with who uses essential oils and food supplements to help her clients heal cancer imbalances. She had been involved with the Tibetan monk tour, but I had forgotten about her healing work until Jeff Beach, the monks’ American driver, called me to check on Kate. I had spoken briefly with the Lama (in broken English) weeks before and told him of Kate’s initial diagnosis, but had put off calling Jeff to fill him (and consequently the monks) in about the update. Jeff said that his Spirit Guides had been telling him something was wrong and to call. Then the seashell that Kate had gifted him during a reading kept turning up—over and over again, until he called The Mesa. He reminded me about our mutual friend and her expertise. This beautiful and generous soul shared with me some of her copious information and actual products she uses. She showed me how to make healing suppositories from organic coconut oil, slippery elm bark powder, and the cancer-killing oils; making a demonstration batch with Frankincense and Lavender oils. (She let me lick the spoon and the energy surged all the way to my hands and feet!) This was not hearsay, channeled information, or stuff she had skimmed on the internet. It was from cutting edge scientific and medical literature she had poured over, and 18yrs of firsthand experience. When Kate used a chunk of the healing mixture that night before bed, she said she felt her whole body say, “Thank You!, Thank You!” By the next morning she looked and felt visibly better, literally overnight. She used a second dose and I could feel her energy surging from clear across the room. We’ve dubbed them “Frankincense Torpedoes”. Something had changed dramatically and we were suddenly both filled with hope. We are so grateful to our friend and for the gifts of the Natural World. This is part of what we have had to learn from this new journey—to put vanity, ego, and even self-reliance aside and allow others to help us in ways that might have once been embarrassing to us. We had to let go of reluctance. Yesterday, we took Kate in to have accumulating fluid drained from her belly once again. As I sat waiting for her procedure (I wanted to watch, but they wouldn’t let me stay in the ultrasound room…) I turned my attention to her and felt sure that Kate had passed a turning point. She was looking and feeling far better on all levels than she had for weeks and even though the cancer was still making fluid it was doing so at a greatly reduced rate. (As it turned out, a liter in 2 weeks instead of 2 liters in one.) Although she is not out of the woods yet, her whole situation seemed to have taken a big step forward towards her being completely healed. The third and highest path was being manifest. After the drainage procedure was complete, I was allowed back into the treatment room and saw the glass bottle with the fluid from Kate’s abdomen on the counter. It was the color of beer, complete with foam on top. I asked if it was OK for me to hold the bottle to feel the energy and consciousness of the fluid and was given the green light by the technician. The first thing I noticed was that it didn’t feel like Kate at all—not her energy as I recognize it. As I focused my attention more closely, I realized that it felt surprisingly and intensely angry. Better out than in, I thought. This morning we talked about how things have been going and realized a problem we have both had: Our reluctance—not stubborn resistance, status quo inertia, or momentary hesitation, but that stopping-before-you-start uncertainty that has so often kept us from acting on our inner drive or knowing. As we talked it became clear that we not only had trouble getting past our own reluctance, but also each other’s and the reluctance of others we interacted with. (Us: “I can give you a healing if you’d like.” Them: “No, I’m good…”) We recognized its prevalence in people in our world, our exposure and indoctrination to it starting in our infancy. This was part of Kate’s (and my) imbalance. I had seen it from the day we met, but lacked the word and point of view to describe it. As we had seen, she would need to drop reluctance in order be her own advocate and to completely heal. We asked our Healing Guides in what new way we needed to deal with reluctance, to release it, move beyond it, work around it, or something else? I heard the answer immediately. Reluctance was something we needed to “push through”, not in a physical way, but energetically and vibrationally. I got the image of punching my way out of a paper bag. Without a name for it, we had witnessed this reluctance with respect to our own creativity, self-expression, and spiritual path. We had seen it in those who were too timid to play a drum, paint a picture, speak in front of others, drive more than 20 minutes to our center, or change. We see it chronically in our culture as non-acceptance of others, apathy, and clinging to the known instead of swinging free to reach for the next rung on the Monkey Bars. We used our YES/NO, Guided Head Movement technique to clear this issue for each of us. The energies released were huge for us both. Kate’s felt nauseous as I stood at her Crown chakra. During my healing, I felt something big relax at my Solar Plexus chakra and realized that reluctance was the antithesis of Will, and the root of procrastination. Both Kate and I are in this for the long haul and have every intention to keep the Mesa Creative Arts Center and Mesa Healing Center open for others during the process. I am working on our schedule of classes and events for fall and hope to have it posted soon. I know I will be less reluctant to teach what I know to those who may be reluctant to receive it. People who know of Kate’s condition have been asking how they can help. We are grateful for any and all prayers for us and The Mesa. We are grateful for meals, money to cover gasoline, parking, medications, insurance deductibles, supplements, and to keep our household running. We may take people up on minding the gift shop. We are grateful for healings being sent and just ask that for the sake of coherence they be sent through our Healing Guides to administer. We also need you to push through your reluctance and keep coming to our center for classes, events, healings, ceremonies, and to participate in the lives of others. For the past 8-1/2 years it has been our dream to create a place of community where people of like mind would come together for healing, creativity, and group work of a higher purpose. While we have touched the lives of many, this has largely not occurred in the way we envisioned. People tend to come for this or that and participate in extended community or community from afar, but not as a coherent group. It is bittersweet to us that Kate’s journey with cancer might be what galvanizes our efforts. So be it. Overall we’re both doing OK at this point, and we have had many signs that things will turn out well in the long run. One day when Kate was in Sewickley Hospital, I saw such an omen. I had been at the Mesa and waited until about 5pm to leave to visit her. It had started to spit rain just as I was going out the door. When I got to Rt. 22, I looked up to see a faint piece of a rainbow. I pulled over and started to take a photo of it, but it was fading fast. I got back in the truck and continued on my way, eventually coming towards the oncology center on Thorn Run Rd. As I got off at the ramp directly facing it, there was the rainbow, more brilliant now and looking as if it was coming out of the roof. I pulled over once again and got two photos off before my camera batteries died. By the time I put new ones in, it was gone. 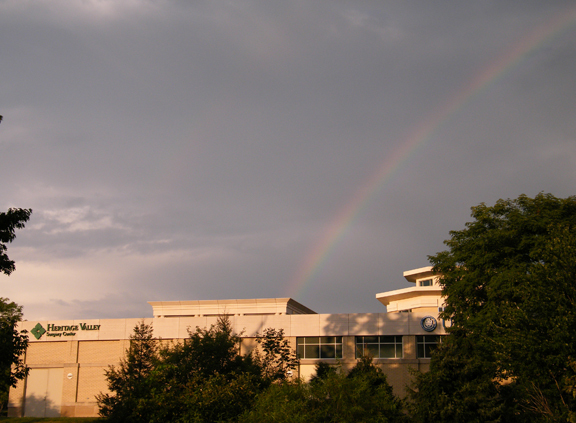 Now, I could have told myself that it was just some coincidence, but the rainbow had appeared to me exactly when I approached the oncology center. If I had left just a few minutes earlier or later I would have missed it entirely. If Kate hadn’t been in the hospital that day, so too would the scene have escaped. I made a print of it and presented it to the staff at the oncology center in humble thanks for their loving care of us. I’ve posted it below. This entry was posted in Cancer Healing and tagged cancer caregivers, cancer inbalance, chemotherapy, energy of blood transfusion, Guided Head Movement healing, healing cancer with medicine and complementary healing, healing from pancreatic cancer, higher paths to healing cancer, making essential oil suppositories, ovarian cancer, pushing through reluctance, seeing healing where it already exists, tibetan monks. Bookmark the permalink.